Schedule a Tour! 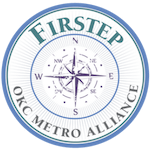 - Firstep - OKC Metro Alliance Inc.
Scheduling a tour will help you get a better idea of the Firstep environment. Please fill out the information below and we will assist you as soon as possible!